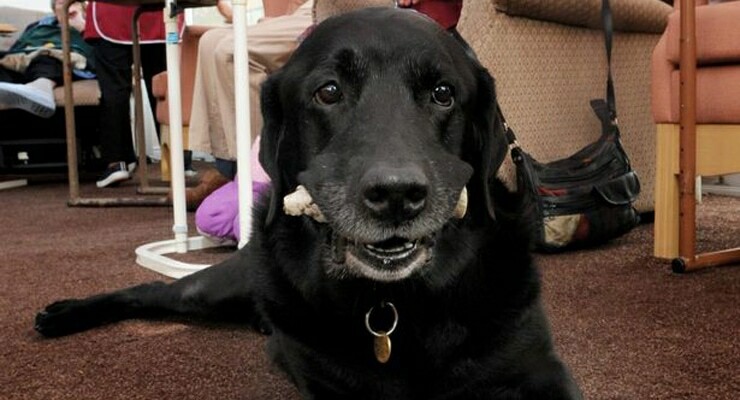 Bob, a 16-year-old Black Labrador from Somerset, England, had a good life. 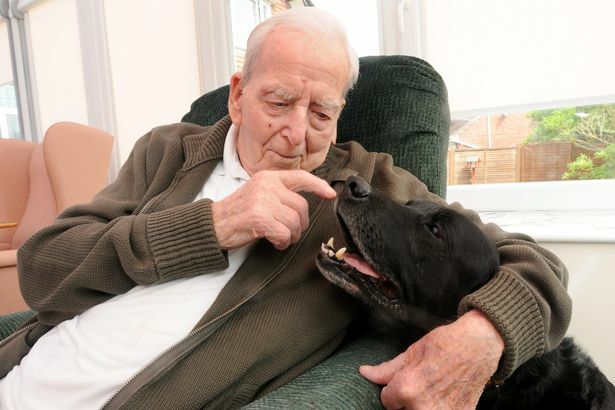 His first ten years of life were spent happily with his owner Harold Pursey in their home, and the last five years were spent in the Burnham Lodge senior residence where the dog made many new friends. Today, the Lodge mourns the passing of Bob, but they are happy to have spent five wonderful years with the dog and find comfort in knowing the dog has earn his angel wings. Pursey was a World War II veteran who moved into an assisted living facility when his health deteriorated. His only family was his dog Bob and when the man had to leave his home, he knew he wasn’t leaving his dog behind. Luckily, a social worker guaranteed both seniors a place in Burnham Lodge and since their move there, Bob became the only four-legged resident and everyone’s best friend. In 2010, Pursey passed away at the age of 94, but before dying he ensured Bob would have a place at the Lodge to live the rest of his days. 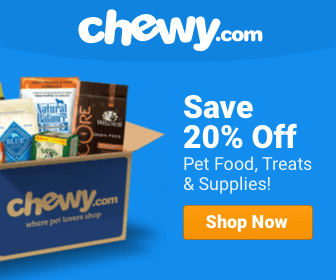 The pet owner left his dog a trust worth just under $1,000, but due to the dog’s declining health, that trust quickly ran out. Yet, since Bob was a loved member of his community, the staff at the lodge did raffles, competitions and collected donations, helping Bob’s trust grow to over $7,000 in the course of five years. This December, just a few weeks short of Bob’s 16th birthday, the dog had to be put to sleep. Bob had a decade where he was solely adored by his owner, but in the five years he lived at the nursing home he was not only loved by his owner but also every resident. He brought smiles to everyone and made every day a brighter one. He will be forever missed and remembered, and it is needless to say the Burnham Lodge will not be the same without Bob. My black lab also passed away at 15. RIP Bob. Oh bet he gave such love to the people there too! He’s with the angels now…..
Aww he had a good life….R.I.P. It was wonderful that he was surrounded by such love. Run and Play at the Rainbow Bridge, Bob! what a wonderful story, for a change, after a seniors passing, the dog was kept at the Nursing home. what a great idea for all involved.. Wonderful story! A life well lived and with purpose. Bob was Lucky to be surrounded by Love to the end. Good for Bob and the seniors. Aw. Bob. Had a fantastic life. RIP Bob! Your purpose was awesome! Good to see a nursing home that permits dogs to live there!!! RIP Mr. Pursey and Bob! Thank you for you service…and what a wonderful example by the nursing home staff!! Thank you and keep up the great work!! Every senior home should have animals! That is so sweet and beautiful. I just lost my little buddy Bandit just a few weeks ago, we were together every day for his whole life. He passed away peacefully in my arms . He was also the oldest dog at our clinic, they have never had an animal close to his age, he passed away at a remarkable age of 18 years and 4 months. You know he’s going to be missed. Sweet old soul. Another of our Bob’s relatives, Violet Calow – same name too! So great that this dog was allowed to stay in the nursing home with his owner! That is just wonderful that the nursing home “let” him live there. No it’s true, they will never forget. Peace and healing to all those that lost a beautiful and sweet doglet this year. So sorry to learn of his passing! RIP Bob :(. Great story! I’m thankful they were able to continue to give him a loving home. what a great story AND what a great senior’s home. Handsome Bob, have fun running on Rainbow Ridge with your family and friends? 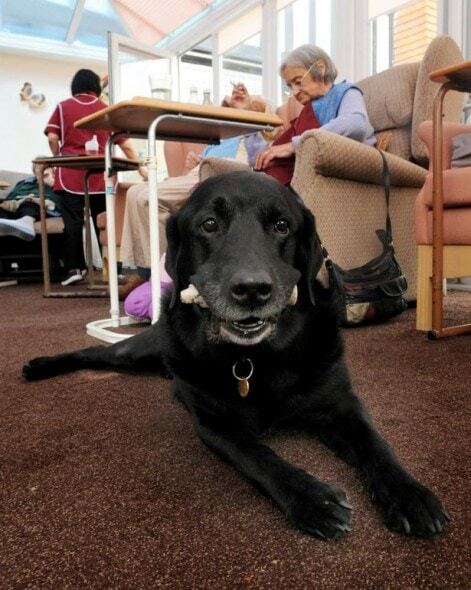 No nursing home should be without a dog or two!!! Lovely story. It must have helped both the gentleman and his dog to spend as many years as possible together. May you enjoy your new life in the thereafter, and live happily ever after. Happy Trails Bob. You’re a beautiful boy. Lots of frisbees and tennis balls and friends over the Bridge ol’ buddy. Run like a pup and say HI to Chigger for us. Sweet travels. RIP Bob, you are forever loved! God bless this beautiful dog.